The biblical reference of The Poor Fisherman is one of several among Gauguin's paintings of specific themes. There is the la Or ana Maria and the Nativity, The Yellow Christ and Jacob Wrestling with the Angel, and the woodcut of the Crucifixion. There is the "Golgotha" self-portrait, and his sacrificial reference to "Les Miserables" in the self-portrait dedicated to Van Gogh. More generally, there is his constant reference to his "Tahitian Eve," and in his letters an imaginative transformation of a South Sea island into a fusion of Cythera and Eden, at once voluptuous and virtuous. 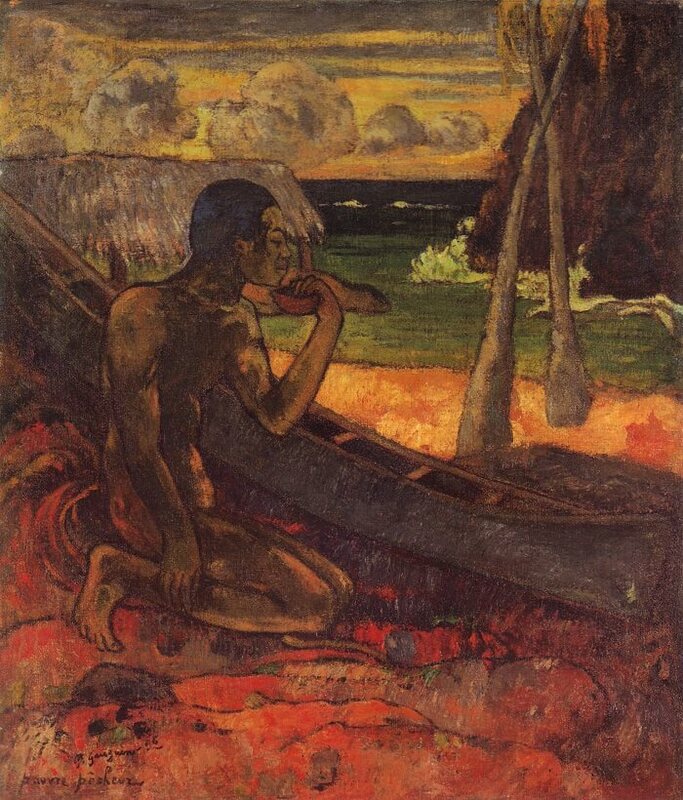 Besides the reference to Puvis de Chavannes' painting of the same subject, Gauguin's fisherman has several associations: the dignity of the simple life; the un-happiness of the "Maoris," mistreated by a colonial government; the isolation, the poverty, the moral grandeur of the painter himself. Set against a luxuriant nature, the figure is tense and thin, hardly typical of the Tahitian life of health and ease Gauguin was so fond of imagining. This contrast is enhanced by the opposition of the patterned foreground, with its irregular lines and upward-pointing corner, and the broad, calm structure of the background beyond the canoe, built of large areas and strong horizontals: a contrast that symbolizes the spirit's struggle.